Glenda Sanchez is so dedicated to Roosevelt High School’s newspaper, The Rough Writers, that many of her peers and teachers – including her principal – suggested the publication be renamed Glenda’s Newspaper. But she doesn’t limit herself to articles. Glenda, 17, has shown that she has talent as a poet and a creative writer beginning seventh grade. She has also performed her poetry on Hofstra University’s FM radio station, 88.7 WRHU. It was in her junior year that her school’s newspaper advisor, Ms. Isom, suggested that Glenda write for the newspaper because she “found my writing unique,” Glenda said, and that advice helped cultivate her desire to achieve greatness. It is evident that Glenda found her calling and love for writing early in life. The Roman poet Horace once said “success in the affairs of life often serve to hide one’s abilities , whereas adversity frequently gives on an opportunity to discover them.” Glenda’s life may prove Horace right because she has encountered her share of adversity. She and her family emigrated from El Salvador when she was four years old. As a young girl with parents who did not speak English, Glenda thought learning English was an impossible task. “It was very hard for me to get a grasp of the English language being that I had only myself to rely on,” she said. However, regardless of all the obstacles, she still managed to navigate through elementary and middle school in the top 10 percent of her class. Through diligence, hours of practice and much help from second grade teacher, Ms. Watford, she was able to learn English. And she began to use the new language – a lot. 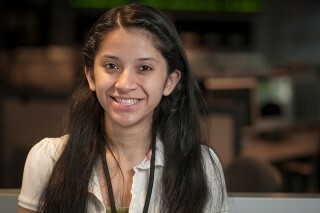 She was a KidsDay reporter for Newsday and shadowed reporters at the New York Times all before entering high school. Since she got the hang of writing in English, Glenda has been involved in numerous writing contests and programs including the Hofstra University Women’s Reading and Writing Workshop and student features for MSGVarsity and, most recently, the Robert W. Greene Summer Institute for High School Journalists at Stony Brook University. She is also involved in soccer, lacrosse, the school band and church services. Her biggest wish is that her mom could read her work. However, Glenda believes that one day her work will be published in English and Spanish. I am sooo proud of u Glenda!!! Keep up the good work lots of love!!!!! Awwww you’ve made me so proud :’) keep up the good work!! Love you so much!! awww Rocky Thanks and love you too! So proud of you! :’) keep doing great things! Did I not tell you that you were destined for greatness?! You will continue to excel because THAT is the fabric you are cut from! I am truly in awe of you.